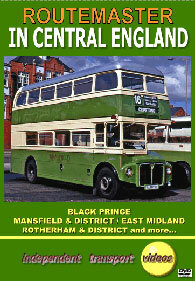 “We start with RM1109 (109 CLT) operating for the well known independent operator ‘Black Prince’ of Morley near Leeds. The Routemaster is seen at various locations including Morley Town Hall, the Gildersome garage and on the 51 service from Morley to Leeds. This route was in competition with Yorkshire Rider who at the time ran Freight Rover Sherpa minibuses on the 52A route. Note the friendly Yorkshire Rider inspector talking to the Black Prince conductor with the Mohican style hair cut! The RM is seen to run rings around other vehicles in the Yorkshire Rider fleet on Churwell Hill, where we also see the Leyland PD3, PTF 702F new to Ramsbottom Urban District Council in 1967. The service is seen passing the Queens Hall, once the home for Leeds trams, Bridge End where the route crosses the river Aire, Cottingley and Churwell. In Vicar Lane we see the owner of Black Prince, Brian Crowther climb into the cab for its journey to Morley. The 424 route between Morley and Gildersome was also another route the RM was used on. A Strathtay Routemaster was also examined and is seen in Texas Street but didn't make the standard and was sent for scrap at Barnsley shortly afterwards. RM441 (Rudolf) from Clydeside Scottish was a regular performer on the Batley Grammar School route "C" and with a name like Rudolf it is fitting that it is seen in the snow. I later purchased RM2208 from Black Prince and returned it to its 1979 colour scheme commemorating 150 years of London Buses. Confidence of Leicester was another operator to use the iconic Routemaster on schools services and here we see RM655 departing from Leicester city centre. Liverline of Liverpool operated RM1776 and it is seen returning to the garage on a dull day after working on the 39 route. East Midland and Mansfield & District operated RM980 and it is seen departing from the Crich Tramway Museum on the 45 route to Chesterfield, which continues onward to Shirebrook. RM10 and RM980 visited an open day at Dewsbury Bus Museum, later to be the home of RM2208 from 1993-2012. RM1109 was also hired by Northern General and here we take a ride across the bridge into Newcastle upon Tyne.